Scarlets flanker Dan Davis signs his first professional contract with the region. 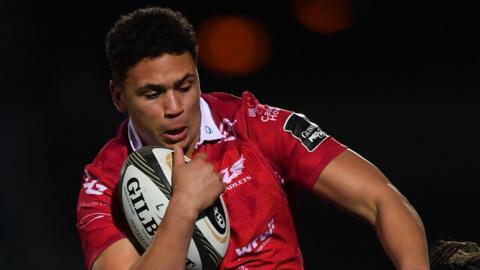 Cardiff Blues are in talks to sign back-rower Will Boyde who has been released by the Scarlets. After experiencing rugby's great highs, Wales and Scarlets flanker James Davies reflects on a frustrating season. Scarlets coach Wayne Pivac says his region's hopes of Champions Cup qualification and the Pro14 play-offs are still alive. Who will prevail in the Pro14 shakedown? Read more on Who will prevail in the Pro14 shakedown? Scarlets and Scotland captain on life as a nomad, learning to laugh at himself and an 'outstanding' Pro14 semi-final with Glasgow. Where have Wales' top-flight coaches gone? No Welshman will be in charge of any of the nation's major rugby teams in 2018-19 after Allen Clarke took over at Ospreys. Read more on Where have Wales' top-flight coaches gone? Leigh Halfpenny says Scarlets are ready to beat the best in order to achieve their Champions Cup ambition. Wales saw some progress while also enduring their share of pain during the 2018 Six Nations, writes Gareth Griffiths.